Two or Three Things I Forgot to Tell You is Joyce Carol Oates’s latest young adult offering, and I always feel like these novels are attempts by her to make sense of new technology. In Oates’s young adult novels, Internet searches, instant messaging, and texting take up great chunks of the book and are important plot points compared to her adult novels and short stories. And there’s nothing wrong with that. I often have to ask younger kids how to do something on the computer. They’ve grown up always used to one while I had to learn in my last few years of high school. I know Oates got a new iPhone a while ago and was enamored with the photo function. Lots of cat pictures followed, which is very teenage girl, and I can’t help thinking that maybe this novel coincides with her acquisition. 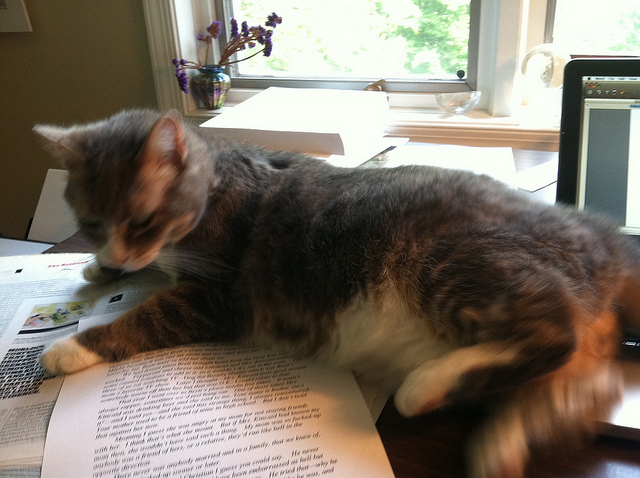 A recent cat portrait by Joyce Carol Oates. In this novel, the story is told through two perspectives, Merissa Carmichael, a triple-A personality who’s been accepted early to Brown, and Nadia Stillinger, an insecure, curvy girl who’s been told she’s fat so many times that she now believes it (she’s five foot four and weighs 119 pounds at her heaviest). The unifying factor between these girls is that they were part of an inner circle that all received a last cryptic text from the boldest of them, Tink Traumer, before she committed suicide. The two different viewpoints didn’t really work for me. They felt uneven, but I guess the point of them is to show how Tink’s strength, ever after her death, helps these two girls when they are at their worst points and quite close to suicide to themselves. Tink Traumer came to their school a few years earlier, a short, slight girl with an exotic past. Her mother is a television actress and very glamorous to Tink’s friends, and Tink herself was a child actress for several years on the same drama series as her mother. Now, Tink wants nothing to do with the world of acting and refuses to answer any questions about that time period. Tink’s not much to look at. She has red hair that she shaves off, is covered in freckles, and wears the same clothes day in and day out, but she makes up for that with her bravery. She’s a gifted artist and quite lippy, challenging teachers and adults when she feels it’s needed. Her friends are part of a popular clique, and all have their problems from the Perfect One, Merissa, whose home life is breaking apart and copes by cutting, to the weakest member, Nadia, who’s so eager for others to like her that she ends up sexually abused and the victim of cyberbullying. Both Merissa and Nadia have strong fathers who only seem to care about their daughters as far as how much of a credit they are to them. Merissa’s father is proud of her prize-winning essay that’s posted on the Scientific American website, but he doesn’t have time to read it, and he’s thrilled that she’s won the coveted part of Elizabeth Bennet in the school theater production of Pride and Prejudice but doesn’t understand her reasons for quitting, or resigning her role, as Merissa puts it. Nadia’s father puts her in the best school possible—she’s nearly as recent as Tink to the high school—and her job is to not embarrass him. (She’s the baggage left over from his first marriage; he’s on his third now.) After a sexual experience happens that she doesn’t remember because she was drugged, Nadia is the subject of many rumors at school and is mercilessly harassed by the boys. She develops a crush on one of her teachers, Mr. Kessler, and after some bad decisions, her father is after him, accusing Mr. Kessler of something that he didn’t do. Nadia’s father doesn’t listen to his daughter; he just wants to punish what he perceives as a slight against him. This isn’t a terrible book; I finished it. But I like Oates’s other young adult titles better. This just felt like a list of teen problems to me: suicide, check; cutting, check; and oh yeah, body image. I’m puzzled about what the novel’s big message is. The girl who is apparently the strongest in the clique commits suicide and then her spirit helps others who are having problems? Or is the message as simple as appearances are deceiving? I have no takeaway from the book. I reflected for a moment on cutting and body image, but the teens of today are coming up with their own solutions like the Butterfly Project and petitions to teen magazines to stop photoshopping models, making unrealistic images. I’m not sure that they would have much use for the girls presented in Two or Three Things I Forgot to Tell You. 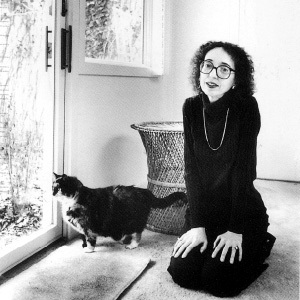 Joyce Carol Oates and cat.